Costanzo and Krauss show students how psychological science can be used to enhance the gathering of evidence, improve legal decision making, reduce crime, and promote justice. With the integration of fascinating real trials, cases and other examples of the legal system in action, the authors illustrate how research and theory can deepen our understanding of suspects, criminals, police officers, victims, lawyers, witnesses, judges, and jurors. 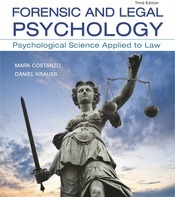 Costanzo and Krauss accessibly illustrate the relevance of key research findings in social, cognitive, clinical, and developmental psychology to virtually every aspect of the legal system psychologists have studied.